There are moments that have left imprints in the minds of many – the past that can be revisited through objects or events with thoughts and images amalgamated in energy, color and determination. One Little Indian, the latest show at RNG Gallery, by Sarah Rowe does just that. Her work combines images from both the present and the past. Rowe’s narrative is colorful and bold, but never simple. Each piece reflects the history of who she is, but is morphed to reflect the narrative of today. There is an elusiveness to Rowe’s contemporary Native American work that makes the viewer look closer and see the spiritual and physicality of that image which is emblematic of current cultural conditions. One of the first works of hers that you see when you enter the gallery is “Cultured,” a small acrylic painting on birch. The black braids are accented with a blue and white headband and red tipped feather. The face is blue and absent of any features; only the word “cultured” is visible, written in white. “Reigning” is a piece that showcases her knowledge of printmaking and saturation of color. Rowe has taught printmaking in the past and this piece seems to highlight the awareness of that process. Painted with acrylic on paper, the piece looks as if it is a print. The lines are so clean and the color so vivid one would think the only way that could be achieved is by printmaking. But, that is a misconception. The Native American motifs that are interjected into the painting call attention to the red deer balanced on the coyote’s head with the rain falling into the valley. Two uplifted grey hands flank the painting. The pink buffalo “Pawn” that dominates the galleery, literally, is an incredibility striking piece that makes you linger and ponder the cycle of life and death. 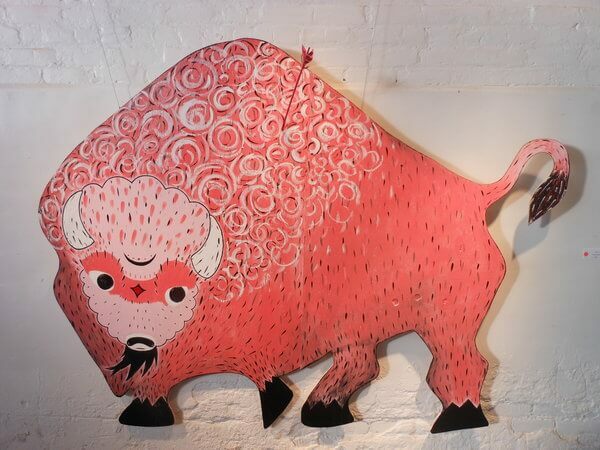 It is an acrylic work done on wood and painted in a variety of pink hues and shot with a pink arrow that is sticking out from the back of the buffalo. “Confrontation” is a mixed media on canvas that is a cross between artistic styles of Dan Namingha and Jean-Michel Basquiat. Moving away from Rowe’s illustrated work to the use of Native American iconography there is a visual transformation and heaviness seen within this piece. The houses and eye tells a visual story and rich use of color help with the narration. The symbolic use of people both large and small enhances the storytelling. The final piece in the show is a definitive piece for Rowe. It is the last painting she completed now leading her into a new focus and a hope to do a whole series based on this piece. “Winter Count” with its abundant use of iconography showcases her heritage, as well as a modern narrative and subtext of Rowe’s visceral understanding of the past. There is an offbeat enchantment to Rowe’s work. With the use of bright candied colors, the personal imagery of her culture, and use of unique materials experimenting with alternative processes, the result can be somewhat abstract but layered in history. There is a modern nostalgia to her work that can transform it and make the viewer examine its reality both strange and familiar. One Little Indian continues through August 3rd, 2014 at RNG Gallery, 157 West Broadway. For details and hours, go to dixiequicks.com or call 712-256-4140.